Nestled into the foothills of the majestic Rocky Mountains, Boulder, Colorado has outdoor adventure coursing through its glacial tap water. The city boasts one of the most distinguished hiking, biking, mountain climbing and running communities in the world and an unparalleled quality of life. Surrounded by more than 45,000 acres of open space and mountain land protected and maintained by Boulder County—the first city in the country to acquire land with public tax revenue—there is seemingly unlimited fun to be had within a stones throw of downtown, helping to make Boulder the fittest city in the country. Here are some of the classic and clandestine trails in and around Boulder, where you can hit the dirt and be back downtown in time for happy hour. As the name suggests, the Flatirons Vista trail is all about the view. From the trailhead, a loose gravel road leads west toward the iconic Flatirons, the symbol of Boulder. Eventually the trail thins into a single track that winds through a golden prairie, as the monolithic rocks draw nearer, before dipping into tree cover. Just when you expect to begin running uphill toward the flatirons, you come out of the trees to the revelation that the trail begins on a plateau and drops into a valley, an absolutely religious experience. After the big reveal, the trail only evolves as it connects to the Doudy Draw and Spring Brook Loop trails, winding up into the foothills above the valley. From the prairie on the plateau, to the shrub filled valley, into the pine forests and red dirt of the foothills, delving into this set of trails takes you across multiple landscapes and ecosystems. Chautauqua Park is where it all began for the Boulder adventure scene. The 80 acres that originally made up the Chautauqua wilderness were purchased in 1898 and expanded over the next 22 years to include the surrounding Flagstaff Mountain, Bear Mountain, Royal Arch, and Green Mountain. When you visit the park—easily accessible from downtown Boulder—you immediately appreciate the vision and foresight of the founders who protected this incredibly special land, keeping it safe from development, mining and exploitation. Chautauqua is an important part of the iconography that forms the identity of Boulder and also one of the most developed natural areas, with tennis courts, playgrounds and event spaces. The main Mesa Trail winds south from the main trailhead and connects with many of the paths in Boulder Canyon, allowing for some serious all-day outings. Trail design and construction aren’t what we normally think about when we lace up our hiking boots for a few hours of offline enjoyment, but the Betasso Preserve, one of Boulder’s newest trails, gets a mention because it’s a work of single-track art, beautifully composed and designed in every way imaginable. You’ll never get bored hiking, running or biking at Betasso because the combination of two main loops and various links creates a playground that can be crisscrossed and careened through all day long. A diverse terrain, from technical rocks to loamy clay with rolling hills to steep switchbacks accentuated by breathtaking viewpoints, makes this pure trail bliss. Widely popular among mountain bikers and runners, Hall Ranch boasts an impressive 3,000 acres of open space, winding through rolling grasslands and scenic buttes in the foothills north of Boulder. You will catch glimpses of wildflower and deer, maybe even bears and eagles, but you will want to stay focused on the trail in front of you—Hall Ranch is widely known and slightly feared for its relentless technical terrain, full of sharp rocks, ruts and roots. One of Colorado’s most endearing and deadly ascents, Longs Peak, looms over the Hall Ranch trail system. For some perspective on how serious Boulder takes its extreme sports, consider that local legend Paul Pomeroy made the ascent to Longs from Boulder by way of Hall Ranch. The fact that he ran or hiked for over 28 hours almost completely on trail is also a testament to the extensiveness of Boulder’s trail system. The historic Switzerland Trail (pictured at top), dating back to 1883, is the highest altitude endeavor on this list and also the longest single trail. Before mountain bikers and off-road vehicles roved here, a train meandered perilously from Boulder to mining camps along the Front Range, carrying supplies and eager miners in search of gold. Today, the recreational trail runs from the Eldora ski area to the town of Ward, climbing and descending between 7,000 to over 9,000 feet in altitude. The high altitude translates into late season snowpack and many snowshoe and cross-country ski trips during the winter. 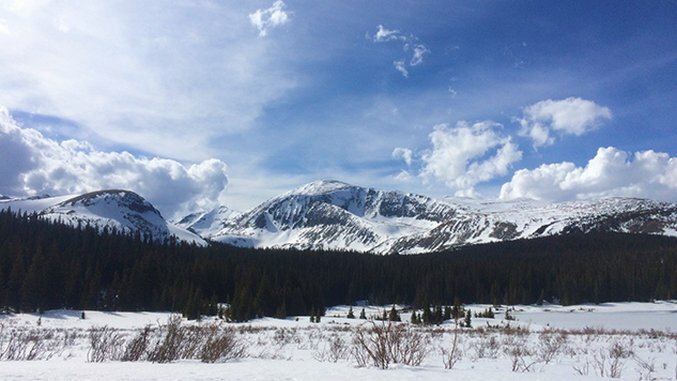 In addition to passing by multiple historic mining sites and abandoned shafts, the Switzerland Trail offers opportunities to catch glimpses of the Continental Divide. There are many offshoots and side trails that offer entertaining detours, like the short hike from the Switzerland Trail up Sugarloaf Mountain.